If you read this post you'll know I was at the glittering awards ceremony recently for the Oscars of the hairdressing industry, the L'Oreal Professional Colour Trophy Awards. With the night that was in it, it seemed like a good time to work a few of the latest L'Oreal releases into my look. Keep reading to see what I put on my face! Base: I've been trialling some pieces from the L'Oreal Magique range for an upcoming Beaut.ie review. Here I was wearing the Lumi Magique Light Concentrated Primer, Light Infusing Foundation in shade Pure Beige and Lumi Magique Touch of Light Highlighting Pen. Cheeks: Blusher in Starlet, from the gorgeous Dita Von Teese Classics Collection for ARTDECO; MAC Mineralize Skin Finish in Porcelain Pink; YSL Terre Saharienne in #1, Tanned. Eyes: Mac Painterly Paint Pot; Eyeshadows in #300 Night Porter; #370 Wisp; #375 Plush and #530 Sepia from the Dita Von Teese Classics Collection from ARTDECO; L'Oreal Superliner Perfect Slim; Avon Super Extend Extreme Mascara; Clinique Bottom Lash Mascara; Clinique Superfine Liner for Brows. Lips: L'Oreal Rouge Caresse in Impulsive Fuchsia (check out my review and swatches). Have you tried any of this little lot? Tell me what you made of it in the comments! that is seriously pretty missis. You look amazing Emma - I hope you enjoyed your glamorous evening ..
LOVE this look on you Emma! 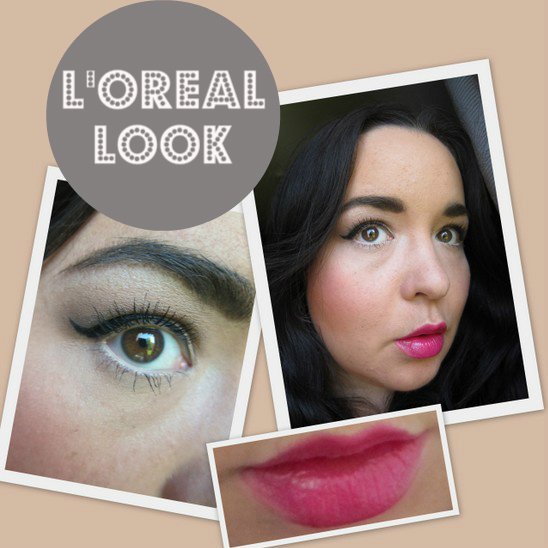 The pink lip is fab with the lined eyes! The only think I've tried from these products is the l'oreal liner which is my favourite high street liquid liner. Gorgeous lip color and perfect eye line. I love YSL and MAC.